It refers to the deed of partition of June 8, 1869 between Bolado and Arques. June 3, 1873 – Joaquin R. Arques to Ellen G. Arques, his wife: deed; consideration of natural love and affection and other valuable consideration: doth give and grant all my right title interest and estate in and to those certain lots, pieces or parcels of land &c being an undivided 1/3 interest to 7,680 acres of land and portion of Rancho Santa Ana and for a more particular description of the lands hereby intended to be conveyed reference is made to a deed of partition dated June 8, 1869 made between Joaquin Bolado and José G. Arques and also to a deed dated November 11, 1871 from Joaquin Bolado to the said José G. Arques. Thursday, May 9, 1872 – Joaquin R. Arques of Santa Clara and Luis Arques of Monterey County, executors of the estate of Joseph G. Arques, 1st parties, and Estanislao Hernandez of Monterey County. 12/26/1871: On the death of José G. Arques, He owned one undivided 8th of Quien Sabe abutting on San Joaquin Rancho and Santa Ana. 2/18/1872 The Arques’ sold to Hernandez ALL the right, title and interest in Rancho Quien Sabe (Santa Ana is not mentioned) – This is a confirmation of the sale referring to Probate Book A, page 321. 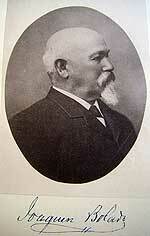 Sunday, February 18, 1872 – Estanislao Hernandez buys all of the José G. Arques estate's share of Rancho Quien Sabe. On the death of José G. Arques, he owned one undivided 8th of Quien Sabe abutting on San Joaquin Rancho and Santa Ana. 2/18/1872 The Arques Estate sold to Hernandez all the right, title and interest in Rancho Quien Sabe (Santa Ana is not mentioned) – Later, on May 9th 1872, is a confirmation of this sale referring to Probate Book A, page 321. April 5, 1869: Joaquin R. Arques sold [unknown parcel] to Francisco Sanjurjo.